Pumpkin Madness features the fun of the farm’s fall festival — a corn maze, rope swings, giant slides, hayrides, straw tunnels, a “farm chores” area, farm animals, and more — plus fun ways to watch the pumpkins get dropped from the High Drop, squished with the Squisher, or smashed with the Smasher.” Guests can bring their pumpkins of any size to contribute to the fun, or even stomp them themselves in the Stomping Grounds (dress appropriately for the mess!). The grand finale on the last day of Pumpkin Madness is the dropping of the giant pumpkin from a crane. 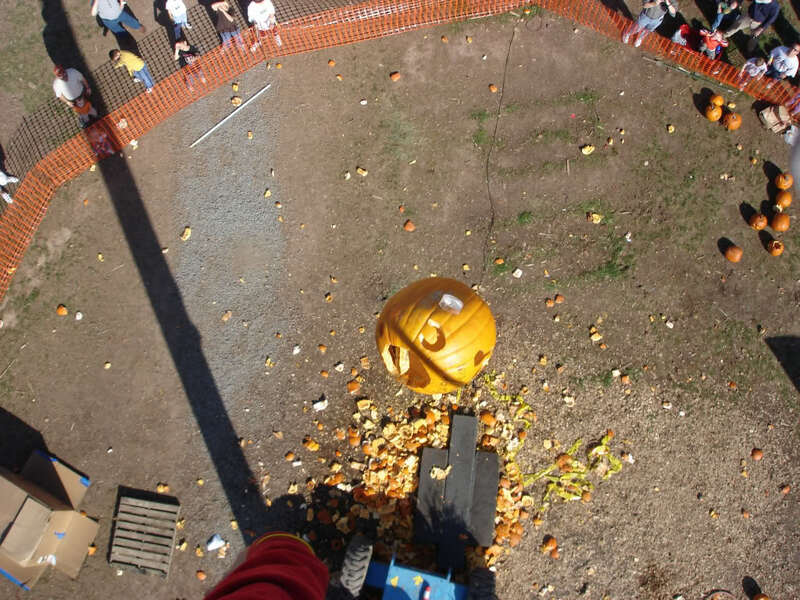 See the pumpkin smashing in action in this video on the Cox Farms site. Pumpkin Madness hours are 10 am to 5 pm with the last entry at 4 pm. 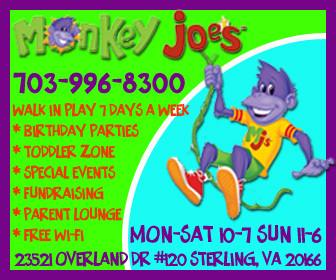 Admission is $10 per person for anyone age two and up. (Note: Cox Farms also will be open for bonus days of the regular Fall Festival (no “Pumpkin Madness” activities) on the teacher workdays of Monday and Tuesday, November 6-7; on those days hours are the same and admission is $10 per person). These are your final days to play this season, and you can enjoy all the usual fun at a reduced rate during this “value visit” time. Want to enjoy the fun of Pumpkin Madness or the Final Days to Play for free? We’re giving away tickets to one lucky winner! One Fairfax Family Fun reader will get a guest pass for free admission for up to four people on either day of Pumpkin Madness. To enter, leave a comment below between now and 10 pm on Friday, October 27, 2017. 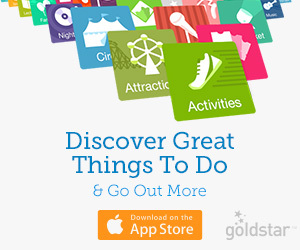 One winner will be randomly selected at that time by a third-party app. The winner will be notified at that time and must reply by 10 pm on Saturday, October 28, 2017, to claim the prize; failure to do so risks forfeiture. The tickets will be held at the Customer Service desk at Cox Farms under the winner’s name for pick-up in person. These tickets are for one-time use only during November 3-7, 2017. Contestants agree to abide by our giveaway terms and conditions. Giveaway open to entrants ages 18 and up. The retail value of the prize is $40. Share the post "Cox Farms presents Pumpkin Madness weekend"
Love Cox Farms and how it has something for every age. 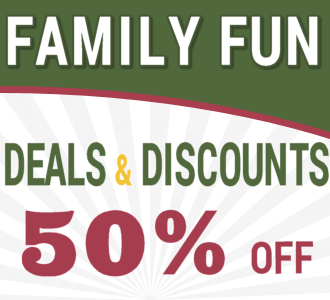 Would love to take my kids to Cox Farm for the first time, thanks to Fairfax Family Fun! Pumpkin Madness looks like so much fun! I can’t wait! Heard about how great this event is! We’ve never been but our kids would love this!! We have never been to Pumpkin Madness – would love to go!! I would love to take my daughter for the pumpkin madness ? Would love to smash some pumpkins. Would love to go to pumpkin madness at Cox Farms. Good luck everyone! We love Cox farms! Thank you so much for the chance to be able to take my girls! And Pumpkin Madness gets Daddy excited! I would love the tickets. Thank you! That would be great for the kids to see! Pumpkin Madness looks like so much fun! I would love to take my grandchildren to see pumpkin smashing!! Thank you very much. I am crossing my fingers ? Me and my kids love Pumpkin Madness! We’d love to go! Love to be a part of Pumpkin Madness. Kids have had so much fun at Cox Farm, we hope to be there for this fun event! I’ve heard so many great things about Cox Farm. Would love to go! One more chance to play at the best playground ever, would mean the world to my 4yr old son! He asks to go back every night before going to sleep! Safe to say the Prehistoric Dino-themed slide is his and many others favorite!! what an awesome giveaway! our family’s ever been ! oohh ohhh, pick me pick me ! Love Cox farms! Haven’t ever been to the pumpkin smashing event. I missed out on taking my 3-year-old to Cox Farm this year due to illness. I would love to win and get a “Do Over” bonding experience with Violet who absolutely loves everything about Halloween. I would love to take my family to Cox farms this year! My family would LOVE to see the pumpkin madness!! ❤️? We haven’t been yet this season but are planning to go for our first Pumpkin Madness. My boys love the slides. We’d love to win passes. Thanks for the opportunity! This sounds so fun! Would love to go! Would love to win! My husband and I have gone every year for 8 anniversaries. Our family lives Cox Farms! Oooo pick me! 🙂 I have three little kids and my husband is away. I would brave the outing alone with free tickets lol This is right up their ally! My family and I have never been to Cox Farm for this event. My 2 year old and husband would love this. I love cox farm. We love Cox Farms but haven’t made it there this year. Would love to go during Pumpkin Madness weekend!! We would love a chance to go to Cox Family farms! Pumpkin madness sounds like so much fun. Would love to have my grandsons join in. My boys would love smashing pumpkins! Yes!!! Would love to go here. New to the area and this place looks so cool! We are in! So fun!